I attended the AHDRA (All Harley Drag Racing Association) drag race about a week ago in Woodburn, Oregon. Before we go any further, allow me to interject a disclaimer: I’m not a big racing fan. In fact, I attended NASCAR (Daytona 500) a few years ago – the so-called ‘superbowl’ of racing — on a work gig and for me watching guys make left-handed turns hour after hour ad nauseam was boring. Fortunately watching the fans worship drivers with brightly colored advertising attire while discussing race strategy in that southern accent made the event. Watching the tire changes in the pit were entertaining for awhile, but they can’t hold a person’s interest forever. At any rate I walked through the AHDRA pits in Woodburn and got my fill of all the Nitro Methane action I could possibly handle. The rev/roar of engines created a race atmosphere and there was indeed some great racing competition on the track from the various fields. As a “newbie” to the AHDRA, I had no clue who was on the 2011 qualifying and elimination sheets or did I understand the difference between Top Fuel, Pro Fuel and the Screaming Eagle backed classes other than the obvious noise level in the motor differences. My observation was that after the too few Nitro Methane class motorcycles finished their runs everything else seemed in slow motion. Yeah, the non-nitro motorcycles were fast, but there is a huge perceptual difference from 150MPH vs. 220MPH. When standing around the staging area/pits I did overhear some rumblings about how the entire AHDRA series is awaiting its demise. Being a nu-bee at this motorcycle drag race gig I wouldn’t know about attendance figures. I typically sit behind a desk and tap on a keyboard. Clearly the economy has impacted most everyone so why wouldn’t race organizations be struggling (NHRA, NASCAR, ADRL, AHDRA) or see a drop in attendance and racers too? I did leave feeling of bit hungry due to the fact there was no action in the new Draggin Bagger class. A class that the H-D Motor Company backed and promoted heavily in December of last year for the 2011 racing season. There was an amateur contestant who took his fully loaded cruiser, tour pak with dual antenna’s out there to run the strip. I’ll give the dude a shout out for doing a burn out on that thousand pound behemoth. On departure there seemed to be a number of people who had a secret fantasy of being an AHDRA driver. The Steve Dorn wannabe’s came out as I was driving the bike 75MPH in a 65MPH zone, trying to shake the guys who were riding in my draft. It seemed like the normal speed limit no longer existed and riders were looking for a side-bank to pass on the shoulder. This went on for about 15 miles then the Wilsonville I-5 construction had brake lights flashing as an old lady (yes, older than me) shot a dirty look in the rearview mirror while she jockeyed for a pole position in a lane that was moving ever so faster. 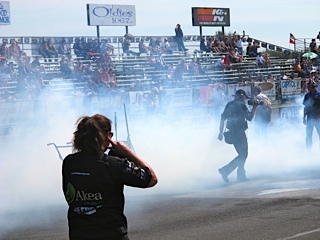 The Northwest Nitro National race results are HERE. I’ve had a lapse in concentration. 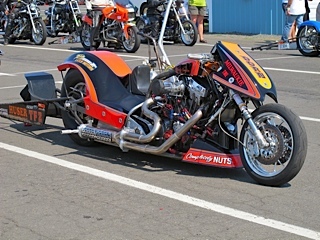 Not only about the All Harley Drag Racing Association (AHDRA), who will bring an exciting race to Oregon this weekend August 27-28th, but you might have noticed the blog posts have become fewer of late. Unfortunately a new job has me fully booked and while I have a number of partially completed posts in various stages I’ve just not had the spare time to polish them up and get ‘em to the line. 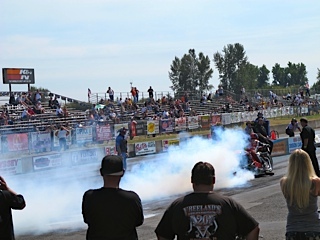 And speaking of the line, I wanted to bring to your attention how AHDRA and Team Latus Motors H-D are bringing the “Northwest Nitro Nationals” to the Woodburn Dragstrip and if you’re a speed junkie or maybe you just like to hang out in the pits — then this is a must attend event. Fans can expect to see plenty of fast action with tire smoking and fire-breathing bikes. Interested in reading more? 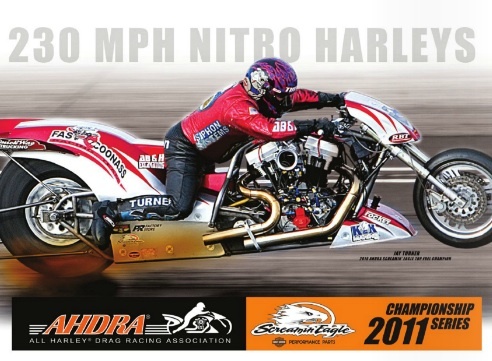 Here is a link to SPEED, the official magazine of the all Harley drag racing association. It’s time to forget the finances and focus on the road! Fortunately Washington and Oregon have partnered up to provide a unique riding opportunity for the 2010 H.O.G. Rally and this is a save-the-date notice. Motorcyclists now have the opportunity to attend two rallies back-to-back and ride more than 1600 miles on some of the Pacific Northwest best roads. The Washington State H.O.G. 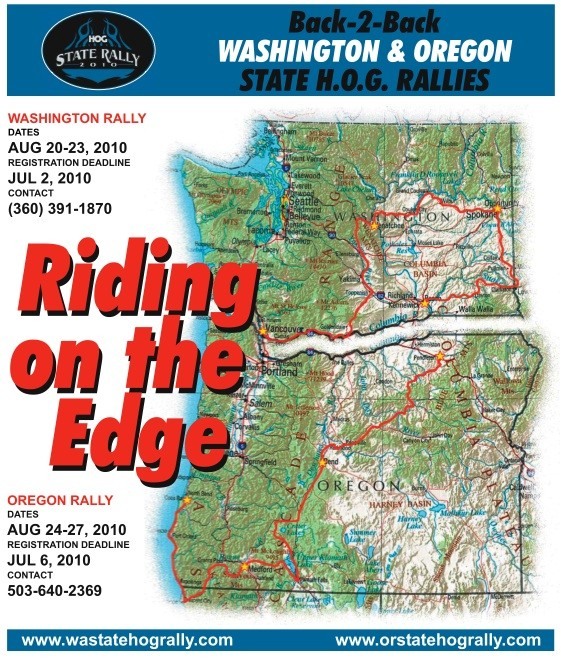 Rally starts in Vancouver, WA and edges its way up the Columbia River Gorge to Yakima and Wenatchee. The rally ride “edges” ever northward along the Columbia River, with a stop at Grand Coulee Dam then on to Spokane. The final day takes motorcyclists down the eastern “edge” of Washington State and into Lewiston, ID, then on to Kennewick for the closing ceremonies. Then a day later and only a few miles from the end of the Washington Rally starts the Oregon Rally. Pendleton is the start of Oregon’s Rally and you’ll ride the “edge” of the Cascade Mountain range to an overnight stay in Bend before “edging” along to Crater Lake and then an overnight in Medford. The final day puts motorcyclists on the “edge” of the Pacific Ocean with closing ceremony in Coos Bay. Below are the dates, links for registering and additional information. Facebook fans can go to Oregon and Washington fan pages. All bomb technicians in America go through the Redstone school, which is the only one of its kind in the U.S.; there is another similar school in England. 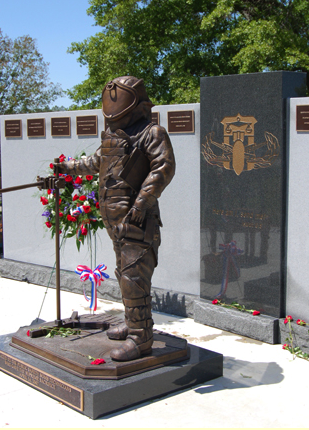 Located on Redstone Arsenal in Huntsville, AL the school is a joint Army-FBI effort which has been involved in training members of the 468 law enforcement bomb squads across the nation. Why is this relevant? A couple of years ago I attended a reunion from when I was stationed on Kwajalein in the Marshall Islands. The reunion was held just down the street from the Redstone Arsenal. I was able to tour several of the military facilities and remember the heat/humidity. But, I’ve digressed. The bomb disposal community is an elite and tightknit group. They even have a special badge the technicians wear which symbolizes the closeness. This week William Robert Hakim, a senior trooper with the OSP was honored at an annual memorial ceremony held by the Army-FBI Hazardous Devices School (HDS) where his name was added to the memorial wall. Mr. Hakim, an eleven year veteran was killed in the line of duty a year ago when an explosive device detonated at West Coast Bank in Woodburn, OR. The blast killed Hakim and Woodburn Police Captain Tom Tennant. It also critically injured Police Chief Scott Russell. Mr. Hakim was a graduate of the HDS school and taught other law enforcement officers about arson and bomb investigations. Within a couple of days, Mr. Joshua Abrahm Turnidge (32) and his father, Bruce Turnidge (57) were arrested. You can view the probable cause document which outlines the case against them HERE. It’s an interesting read if for nothing else than the chronology of the events which led the arrests. Evidence at the fathers property found Tovex, a highly-explosive gel which is routinely substituted for dynamite. Prosecutors are seeking the death penalty. The trial is expected to start September 2010. A bomb explosion and the severity of the crimes in Oregon stunned many. I wanted to remember Mr. Hakim on this one-year anniversary. My condolences to his family. Mr. Hakim is survived by his wife, Terri, and their 19 year old daughter and 17 year old son who attended the ceremony.